Housing remains a soft spot in the economy as mortgage applications continue to drop with rising rates and slumping stocks deterring potential homebuyers. According the Mortgage Bankers Association, volume is down 22% from the year prior. Tech and crude oil prices are weighing on equity markets and driving haven demand, even while the overall tone of the economy remains upbeat. The stock selloff saw debt yields retreat, and the benchmark 10-year UST sits at 3.14%, down 9 basis points from the week prior. Municipal bonds also trended lower and were down 3-6 basis points along the curve. Source: Thomson Reuters, Bloomberg. 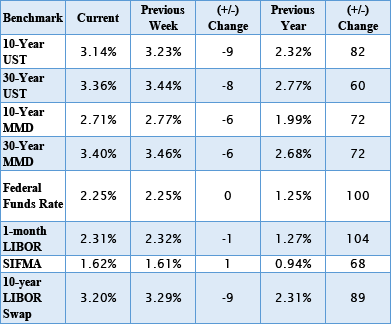 The table above reflects market conditions as of November 13, 2018. The National Council of State Housing Agencies has published an online “Opportunity Zone Fund Directory,” which is a compilation of Opportunity Zone funding opportunities. This resource provides descriptions and contact information for publicly-announced funds that have been formed for the purpose of attracting investment in Opportunity Zones. NCSHA is tracking only multi-project opportunity funds. NCSHA will update the directory regularly and invites funds to submit details for inclusion by completing the submission form. Please contact Jim Tassos with additions, questions, or comments. CohnReznick has launched an updated interactive mapping tool designed to assist New Markets Tax Credit and Opportunity Zone Investment stakeholders. This mapping tool helps access eligibility using census-based criteria from the 2011-2015 and 2006-2010 American Community Surveys. Either census database may be used to evaluate eligibility through a transition period ending October 31, 2018*. To identify the designated Opportunity Zones for potential investment or Opportunity Zone related projects, enter an address. If an address falls within an Opportunity Zone, that designation will appear. Enter an address or US census tract number for your project to see if it is “Qualified” for the NMTC Program and if it meets “Severely Distressed” criteria. Any correlating Opportunity Zone designation also will appear if it meets that program’s criteria. Opportunity Zone Webinar Recording: Stemming from the Tax Cuts and Jobs Act of 2017, Opportunity Zones were created to help spur investment in distressed communities. There is estimated to be $2 trillion worth of unrealized capital gains “sitting on the sidelines” with the potential to unleash this for investment across America in distressed, low-income communities. Once accumulated and deployed, this capital will help rejuvenate these micro-economies, stimulate growth and help level the playing field for those living and doing business in low-income communities. Not uncommon in the U.S., tax policy is playing a central role in helping to how we administer public policy around creating economic growth. CohnReznick’s Ira Weinstein and Beth Mullen discuss this innovate policy. Hear the program background, how it works, advantages, tax implications and other useful information in this conversational 25-minute recording. Click Here to View. Enterprise has published a new whitepaper entitled Gentrification: Framing Our Perceptions, which summarizes several approaches used in recent studies of gentrification and details the complications these create for identifying where it occurs. It describes how different definitions can lead to different findings about the consequences of gentrification, and how these inconsistencies affect policy making. In a collaboration with Raj Chetty and Nathan Hendren from Harvard University and John Friedman from Brown University, the US Census Bureau has constructed the Opportunity Atlas, a comprehensive Census tract-level dataset of children’s outcomes in adulthood using data covering nearly the entire U.S. population. For each tract, the Census Bureau estimates children’s outcomes in adulthood such as earnings distributions and incarceration rates by parental income, race, and gender. These estimates allow us to trace the roots of outcomes such as poverty and incarceration to the neighborhoods in which children grew up. To build the Atlas, the Census Bureau uses de-identified data from the 2000 and 2010 decennial Censuses linked to data from Federal income tax returns and the 2005-2015 American Community Surveys (ACS) to obtain information on income, parental characteristics, children’s neighborhoods, and other variables. The Census Bureau’s focus on children born between 1978-1983, including those born in the U.S. and authorized childhood immigrants. Our data include the characteristics of 20 million children, approximately 94% of all children born during the time period. US job growth surged in September to its highest level in seven months as the economy put up another show of strength, according to a report from ADP. Representative Mark Meadows (R-NC) has introduced H.R. 6890, the Creating Advancement and Personal Improvement in Targeted American Localities (CAPITAL) Act of 2018. Federal Reserve officials raised interest rates for a third time this year and reaffirmed their outlook for further gradual hikes well into 2019. The quarter-point increase boosted the benchmark federal funds rate to a target range of 2% to 2.25%. In other economic news, consumer confidence rose in September, notching its highest level in about 18 years. The Conference Board’s index rose to 138.4 in September from 134.7 in August. The all-time high of 144.7 was reached in 2000. Bond markets extended their recent selloff ahead of the Fed’s latest policy decision. The 10-year UST yield was up 4 basis points to 3.10%, and the 30-year UST finished 3 basis points higher to 3.23%. In the municipal market, both the 10-year and 30-year MMD were 4 basis points higher for the week, yielding 2.62% and 3.26% respectively. Source: Thomson Reuters, Bloomberg. 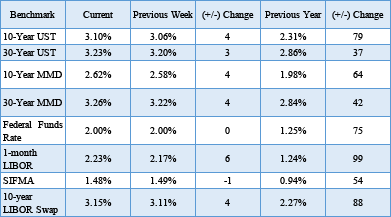 The table above reflects market conditions as of September 25, 2018. On September 12, Citi Community Capital published a whitepaper that outlines the potential application of the Opportunity Zone legislation to affordable housing and LIHTC projects.